As the world grapples with how to implement the SDGs, culture is becoming an increasingly hot topic. How do you reach “the culture” with sustainability? Several AtKisson group members have found one important partner in spreading a culture of sustainability: museums. The following article was written by Douglas Worts. Douglas is a culture and sustainability specialist at WorldViews Consulting, with over 30 years of experience working within the museum world and over 15 years grappling with the personal, local, and global challenges of sustainability. He’s been a member of AtKisson Group since 2013. In the late 1960s, two innovators in France’s cultural world devised a novel concept that would turn the notion of ‘museum’ on its head. If traditional museums are based on centripetal forces that bring together cultural objects, history and people into a single site, then George Rivière and Hugues de Varine’s proposal for a centrifugal variation was revolutionary. Specifically, they imagined a museum that consisted of a territory, a population, collective memory, elders, heritage and special sites, all held in dynamic relationship through centrifugal forces. Essentially this approach argued for museums that were woven into the fabric of community as well as the lives of individuals, where people, museum and city/town are one. Theirs was a living, integrated approach to ‘the place of the muses’, as opposed to an institutionalized approach to culture. The name given to this new approach to museums was ‘ecomuseum’. Over the past 50 years, experiments and variations on the ecomuseum theme have been explored around the world – in both rural and urban settings. Some ecomuseums have reinvigorated entire regions – socially, environmentally, culturally, economically. Some of these experiments have become living-heritage sites that are largely geared to tourism. However, the most interesting ecomuseums, perhaps, have been developed through the work of consciously engaged communities that have roots in heritage, a commitment to the wellbeing of the present and which collectively generate a vision of the future. Glenn Sutter, a curator of human ecology at the Royal Saskatchewan Museum, has been given a mandate to foster ‘community-engaged museums’ (aka ecomuseums) across this prairie province of Canada. 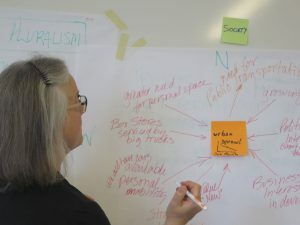 In collaboration with the Saskatchewan Museums Association and Heritage Saskatchewan, many efforts are being made to encourage communities themselves to form ecomuseums that will meet their local needs – culturally, socially, economically and environmentally. In April of 2017, a symposium was organized in Regina to bring people together from many fledgling ecomuseums across the province. It’s purpose was to strengthen the growing network, to share stories and to acquire new tools. Veteran museum consultant and Canadian innovator of ecomuseums, René Rivard, provided a keynote address that reflected on the excitement and impacts of ecomuseums around the world. Many local people contributed stories about their communities and the ecomuseums with which they are involved. 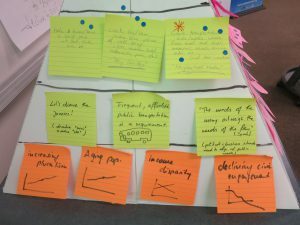 I was invited to provide a day-long training workshop – which I called “Planning for Cultural Relevance”. 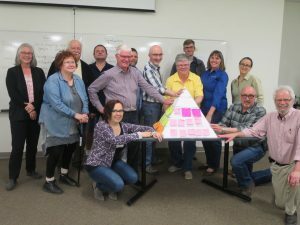 The core of the day revolved around an introduction to two planning tools – Compass and Pyramid – using the fictitious community of Greenburg. Photos courtesy of Heritage Saskatchewan. From top left: Building a pyramid, systems mapping, final pyramid. measuring impacts and changes as a result of humanity’s growth and development. There remains enormous untapped potential for museums to facilitate cultural wellbeing and cultural impacts across our world.